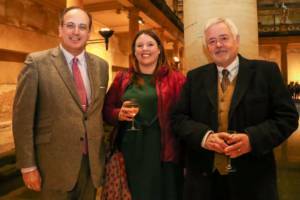 The Great West Way launch event recently took place at the Roman Baths and Grand Pump Room in Bath, and our Deputy Mayor, Cllr Dave Garwood and Tourism & Events Officer, Steph Shearing, went along. The event not only celebrated the launch but was a great networking opportunity with attendees from many businesses, tourist attractions and members of the travel trade who are interested in packaging and selling the route to consumers. Michael Ellis MP, (Parliamentary Under Secretary of State for Arts, Heritage and Tourism), gave a speech expressing how excited he was about the Great West Way and the huge positive impact it could have on tourism across the area. Speeches were also given by some of the headline ambassadors including National Trust, Great Western Railway and Bristol Airport, followed by the first showing of the Great West Way promotion film which you can view below. The Town Council is thrilled that we have managed to secure recognition for our beautiful town of Bradford on Avon on this route, and we are really looking forward to utilising the great opportunities our involvement presents.